MIT Energy Initiative Director Robert Armstrong shares perspectives on past successes and ongoing and future energy projects at the Institute. This year marks 10 years since the MIT Energy Initiative (MITEI) was founded as MIT’s hub for energy research, education, and outreach. To mark the occasion, MITEI Director Robert Armstrong shared his thoughts on some of the MIT energy community’s achievements to date and highlighted promising projects that could lead to breakthroughs in the decades to come. He also discussed the characteristics and resources that have helped MIT develop a thriving center of energy research. Q: What are some of the most significant research impacts the MIT energy community has made over the past decade? • multidisciplinary studies such as “The Future of Solar Energy” and “Utility of the Future,” which have taken a comprehensive, system-level approach to energy challenges, with recommendations for policymakers, regulators, and industry. Q: What do you see as the most promising energy developments for the future? • student and alumni research, technology, and policy development. While we may not even know yet where our current or future students’ research will take them, or what our alumni may achieve in industry, government, or academic roles, I am confident that we’re preparing future innovators to meet energy and climate challenges. Q: Why is MIT a compelling place for energy research? A: First and foremost, it’s the people here: the impressive expertise of the faculty and the intelligence and enthusiasm of the students, coupled with their eagerness to work across disciplines and to engage with industry and government on urgent energy challenges and issues. 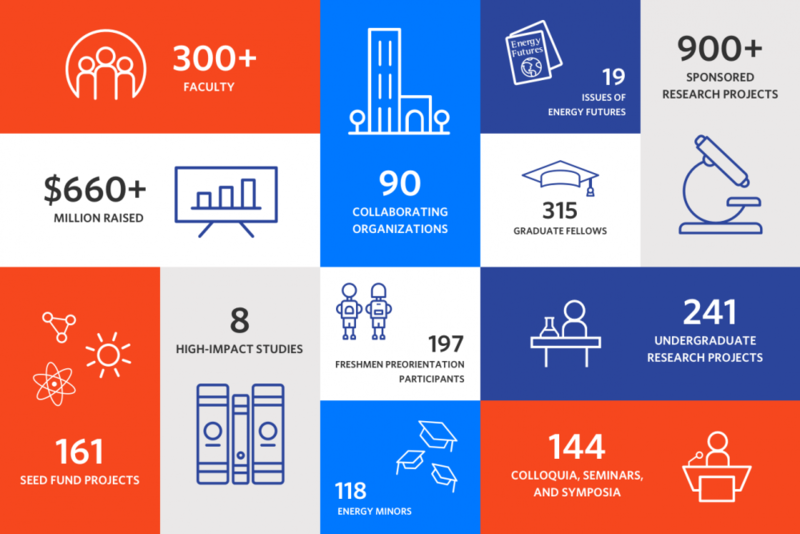 When the Energy Research Council was forming the MIT Energy Initiative, we thought that MIT had the right characteristics for cultivating an energy research and education community. As our researchers have developed projects with about 90 industry and public entities, we’ve seen an amazing degree and depth of collaboration across sectors, including many innovative outcomes that we couldn’t have anticipated. We’re increasingly working to translate completed research into commercializable ideas and companies. For example, the Tata Center for Technology and Design has interesting work going on to help their teams of graduate students and faculty deploy their projects at a larger scale. And we work with and draw on the knowledge of entities like the Martin Trust Center for MIT Entrepreneurship; having these kinds of resources right here on campus makes a huge difference in our ability to launch new business enterprises. The Engine is another prime illustration of a uniquely MIT-developed resource that is already having a positive impact: raising and investing patient capital to support promising projects within and outside of MIT, including energy ventures like Professor Yet-Ming Chiang’s Baseload Renewables or Professor Jeff Grossman’s Via Separations. MITEI’s Low-Carbon Energy Centers continue to convene researchers around specific energy technology areas to address climate change in areas from energy storage to advanced materials for energy applications, working with industry member companies — providing fertile ground for student projects and theses. Our community also has a symbiotic relationship with the vibrant energy ecosystem here in Massachusetts and in the greater northeast region: Our Undergraduate Research Opportunities Program and Energy Studies Minor students have many local internships and careers to choose from, and companies and governments can tap our faculty expertise for speaking events, studies, and projects. The administration’s five-year Plan for Action on Climate Change, support for using the campus as a living laboratory, and interest in exploring other ways of reducing our carbon footprint all generate opportunities for faculty, students, and staff. A few examples include the Office of Sustainability’s work with the Department of Facilities and MIT energy researchers to develop a greenhouse gas inventory, followed by the collaboration with Boston Medical Center and Post Office Square Redevelopment Corporation to develop the solar power purchase agreement for Summit Farms in North Carolina. The upgrades to MIT’s central utilities cogeneration plant also present learning opportunities for MIT and the broader community. These and numerous other factors make MIT a great place for energy research, and I anticipate even greater growth in our energy community in the years to come.